Interferon beta-1a (also interferon beta 1-alpha) is a cytokine in the interferon family used to treat multiple sclerosis (MS). It is produced by mammalian cells, while interferon beta-1b is produced in modified E. coli. Some claims have been made that Interferons produce about an 18–38% reduction in the rate of MS relapses. Interferon beta has not been shown to slow the advance of disability. Interferons are not a cure for MS (there is no cure); the claim is that interferons may slow the progress of the disease if started early and continued for the duration of the disease. The earliest clinical presentation of relapsing-remitting multiple sclerosis is the clinically isolated syndrome (CIS), that is, a single attack of a single symptom. During a CIS, there is a subacute attack suggestive of demyelination which should be included in the spectrum of MS phenotypes. Treatment with interferons after an initial attack decreases the risk of developing clinical definite MS. Medications are modestly effective at decreasing the number of attacks in relapsing-remitting multiple sclerosis and in reducing the accumulation of brain lesions, which is measured using gadolinium-enhanced magnetic resonance imaging (MRI). Interferons reduce relapses by approximately 30% and their safe profile make them the first-line treatments. Nevertheless, not all the patients are responsive to these therapies. It is known that 30% of MS patients are non-responsive to Beta interferon. They can be classified in genetic, pharmacological and pathogenetic non-responders. One of the factors related to non-respondance is the presence of high levels of interferon beta neutralizing antibodies. Interferon therapy, and specially interferon beta 1b, induces the production of neutralizing antibodies, usually in the second 6 months of treatment, in 5 to 30% of treated patients. Moreover, a subset of RRMS patients with specially active MS, sometimes called "rapidly worsening MS" are normally non-responders to interferon beta 1a. While more studies of the long-term effects of the drugs are needed, existing data on the effects of interferons indicate that early-initiated long-term therapy is safe and it is related to better outcomes. Injectable medications can produce irritation or bruises at injection site. 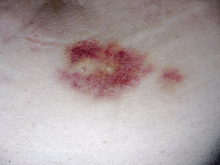 The bruise depicted was produced by a subcutaneous injection. Interferon beta-1a is available only in injectable forms, and can cause skin reactions at the injection site that may include cutaneous necrosis. Skin reactions with interferon beta are more common with subcutaneous administration and vary greatly in their clinical presentation. They usually appear within the first month of treatment albeit their frequence and importance diminish after six months of treatment. Skin reactions are more prevalent in women. Mild skin reactions usually do not impede treatment whereas necroses appear in around 5% of patients and lead to the discontinuation of the therapy. Also over time, a visible dent at the injection site due to the local destruction of fat tissue, known as lipoatrophy, may develop, however this rarely occurs with interferon treatment. Interferons, a subclass of cytokines, are produced in the body during illnesses such as influenza in order to help fight the infection. They are responsible for many of the symptoms of influenza infections, including fever, muscle aches, fatigue, and headaches. Many patients report influenza-like symptoms hours after taking interferon beta that usually improve within 24 hours, being such symptoms related to the temporary increase of cytokines. This reaction tends to disappear after 3 months of treatment and its symptoms can be treated with over-the-counter nonsteroidal anti-inflammatory drugs, such as ibuprofen, that reduce fever and pain. Another common transient secondary effect with interferon-beta is a functional deterioration of already existing symptoms of the disease. Such deterioration is similar to the one produced in MS patients due to heat, fever or stress (Uhthoff's phenomenon), usually appears within 24 hours of treatment, is more common in the initial months of treatment, and may last several days. A symptom specially sensitive to worsening is spasticity. Interferon-beta can also reduce numbers of white blood cells (leukopenia), lymphocytes (lymphopenia) and neutrophils (neutropenia), as well as affect liver function. In most cases these effects are non-dangerous and reversible after cessation or reduction of treatment. Nevertheless, recommendation is that all patients should be monitored through laboratory blood analyses, including liver function tests, to ensure safe use of interferons. To help prevent injection-site reactions, patients are advised to rotate injection sites and use an aseptic injection technique. Injection devices are available to optimize the injection process. Side effects are often onerous enough that many patients ultimately discontinue taking interferons (or glatiramer acetate, a comparable disease-modifying therapies requiring regular injections). Interferon beta balances the expression of pro- and anti-inflammatory agents in the brain, and reduces the number of inflammatory cells that cross the blood brain barrier. Overall, therapy with interferon beta leads to a reduction of neuron inflammation. Moreover, it is also thought to increase the production of nerve growth factor and consequently improve neuronal survival. In vitro, interferon beta reduces production of Th17 cells which are a subset of T lymphocytes believed to have a role in the pathophysiology of MS.
Avonex was approved in the US in 1996, and in Europe in 1997, and is registered in more than 80 countries worldwide. It is the leading MS therapy in the US, with around 40% of the overall market, and in Europe, with around 30% of the overall market. It is produced by the Biogen biotechnology company, originally under competition protection in the US under the Orphan Drug Act. Avonex is sold in three formulations, a lyophilized powder requiring reconstitution, a pre-mixed liquid syringe kit, and a pen; it is administered once per week via intramuscular injection. Rebif is a disease-modifying drug (DMD) used to treat multiple sclerosis in cases of clinically isolated syndromes as well as relapsing forms of multiple sclerosis and is similar to the interferon beta protein produced by the human body. It is co-marketed by Merck Serono and Pfizer in the US under an exception to the Orphan Drug Act. It was approved in Europe in 1998 and in the US in 2002; it has since been approved in more than 90 countries worldwide including Canada and Australia. EMD Serono has had sole rights to Rebif in the US since January 2016. Rebif is administered via subcutaneous injection three times per week, and can be stored at room temperature for up to 30 days. CinnoVex is the trade name of recombinant Interferon beta-1a, which is manufactured as biosimilar/biogeneric in Iran. It is produced in a lyophilized form and sold with distilled water for injection. Cinnovex was developed at the Fraunhofer Institute in collaboration with CinnaGen, and is the first therapeutic protein from a Fraunhofer laboratory to be approved as biogeneric / biosimilar medicine. There are several clinical studies to prove the similarity of CinnoVex and Avonex. A more water-soluble variant is currently being investigated by the Vakzine Projekt Management (VPM) GmbH in Braunschweig, Germany. Plegridy is the trade name of a pegylated form of Interferon beta-1a. Plegridy’s advantage is it only needs injecting once every two weeks. Closely related to interferon beta-1a is interferon beta-1b, which is also indicated for MS, but is formulated with a different dose and administered with a different frequency. Each drug has a different safety/efficacy profile. Interferon beta-1b is marketed only by Bayer in the US as Betaseron, and outside the US as Betaferon. It is an example of a specialty drug that would only be available through specialty pharmacy. This is because it requires a refrigerated chain of distribution and costs $17,000-a-year. ↑ Murdoch D, Lyseng-Williamson KA (2005). "Spotlight on subcutaneous recombinant interferon-beta-1a (Rebif) in relapsing-remitting multiple sclerosis". BioDrugs. 19 (5): 323–5. doi:10.2165/00063030-200519050-00005. PMID 16207073. ↑ Giovannoni G, Munschauer FE, Deisenhammer F (November 2002). "Neutralising antibodies to interferon beta during the treatment of multiple sclerosis". Journal of Neurology, Neurosurgery, and Psychiatry. 73 (5): 465–9. PMID 12397132. ↑ Stachowiak PhD., Julie (2008). "Is Avonex Right for You?". Retrieved 2008-05-07. ↑ Association between use of interferon beta and progression of disability in patients with relapsing-remitting multiple sclerosis. ↑ Kappos L, Kuhle J, Multanen J, Kremenchutzky M, Verdun di Cantogno E, Cornelisse P, Lehr L, Casset-Semanaz F, Issard D, Uitdehaag BM (November 2015). "Factors influencing long-term outcomes in relapsing-remitting multiple sclerosis: PRISMS-15". Journal of Neurology, Neurosurgery, and Psychiatry. 86 (11): 1202–7. doi:10.1136/jnnp-2014-310024. PMID 26374702. ↑ Calabresi, Peter A; Kieseier, Bernd C; Arnold, Douglas L; Balcer, Laura J; Boyko, Alexey; Pelletier, Jean; Liu, Shifang; Zhu, Ying; Seddighzadeh, Ali; Hung, Serena; Deykin, Aaron (July 2014). "Pegylated interferon beta-1a for relapsing-remitting multiple sclerosis (ADVANCE): a randomised, phase 3, double-blind study". The Lancet Neurology. 13 (7): 657–665. doi:10.1016/S1474-4422(14)70068-7. ↑ Jacobs LD, Cookfair DL, Rudick RA, Herndon RM, Richert JR, Salazar AM, Fischer JS, Goodkin DE, Granger CV, Simon JH, Alam JJ, Bartoszak DM, Bourdette DN, Braiman J, Brownscheidle CM, Coats ME, Cohan SL, Dougherty DS, Kinkel RP, Mass MK, Munschauer FE, Priore RL, Pullicino PM, Scherokman BJ, Whitham RH (March 1996). "Intramuscular interferon beta-1a for disease progression in relapsing multiple sclerosis. The Multiple Sclerosis Collaborative Research Group (MSCRG)". Annals of Neurology. 39 (3): 285–94. doi:10.1002/ana.410390304. PMID 8602746. 1 2 3 Freedman MS (January 2011). "Long-term follow-up of clinical trials of multiple sclerosis therapies". Neurology. 76 (1 Suppl 1): S26–34. doi:10.1212/WNL.0b013e318205051d. PMID 21205679. ↑ Lublin FD, Reingold SC, Cohen JA, Cutter GR, Sørensen PS, Thompson AJ, Wolinsky JS, Balcer LJ, Banwell B, Barkhof F, Bebo B, Calabresi PA, Clanet M, Comi G, Fox RJ, Freedman MS, Goodman AD, Inglese M, Kappos L, Kieseier BC, Lincoln JA, Lubetzki C, Miller AE, Montalban X, O'Connor PW, Petkau J, Pozzilli C, Rudick RA, Sormani MP, Stüve O, Waubant E, Polman CH (July 2014). "Defining the clinical course of multiple sclerosis: the 2013 revisions". Neurology. 83 (3): 278–86. doi:10.1212/WNL.0000000000000560. PMID 24871874. 1 2 3 4 5 6 Compston A, Coles A (October 2008). "Multiple sclerosis". Lancet. 372 (9648): 1502–17. doi:10.1016/S0140-6736(08)61620-7. PMID 18970977. ↑ Bates D (January 2011). "Treatment effects of immunomodulatory therapies at different stages of multiple sclerosis in short-term trials". Neurology. 76 (1 Suppl 1): S14–25. doi:10.1212/WNL.0b013e3182050388. PMID 21205678. 1 2 Bertolotto A, Gilli F (September 2008). "Interferon-beta responders and non-responders. A biological approach". Neurological Sciences. 29 Suppl 2 (S2): S216–7. doi:10.1007/s10072-008-0941-2. PMID 18690496. ↑ Buttinelli C, Clemenzi A, Borriello G, Denaro F, Pozzilli C, Fieschi C (November 2007). "Mitoxantrone treatment in multiple sclerosis: a 5-year clinical and MRI follow-up". European Journal of Neurology. 14 (11): 1281–7. doi:10.1111/j.1468-1331.2007.01969.x. PMID 17956449. ↑ Boster A, Edan G, Frohman E, Javed A, Stuve O, Tselis A, Weiner H, Weinstock-Guttman B, Khan O (February 2008). "Intense immunosuppression in patients with rapidly worsening multiple sclerosis: treatment guidelines for the clinician". The Lancet. Neurology. 7 (2): 173–83. doi:10.1016/S1474-4422(08)70020-6. PMID 18207115. 1 2 3 4 5 6 7 8 9 10 11 12 Walther EU, Hohlfeld R (November 1999). "Multiple sclerosis: side effects of interferon beta therapy and their management". Neurology. 53 (8): 1622–7. doi:10.1212/wnl.53.8.1622. PMID 10563602. ↑ Edgar CM, Brunet DG, Fenton P, McBride EV, Green P (February 2004). "Lipoatrophy in patients with multiple sclerosis on glatiramer acetate". The Canadian Journal of Neurological Sciences. Le Journal Canadien Des Sciences Neurologiques. 31 (1): 58–63. PMID 15038472. ↑ Eccles R (November 2005). "Understanding the symptoms of the common cold and influenza". The Lancet. Infectious Diseases. 5 (11): 718–25. doi:10.1016/S1473-3099(05)70270-X. PMID 16253889. 1 2 3 Kieseier BC (June 2011). "The mechanism of action of interferon-β in relapsing multiple sclerosis". CNS Drugs. 25 (6): 491–502. doi:10.2165/11591110-000000000-00000. PMID 21649449. ↑ Mitsdoerffer M, Kuchroo V (May 2009). "New pieces in the puzzle: how does interferon-beta really work in multiple sclerosis?". Annals of Neurology. 65 (5): 487–8. doi:10.1002/ana.21722. PMID 19479722. ↑ Nafissi S, Azimi A, Amini-Harandi A, Salami S, shahkarami MA, Heshmat R (September 2012). "Comparing efficacy and side effects of a weekly intramuscular biogeneric/biosimilar interferon beta-1a with Avonex in relapsing remitting multiple sclerosis: a double blind randomized clinical trial". Clinical Neurology and Neurosurgery. 114 (7): 986–9. doi:10.1016/j.clineuro.2012.02.039. PMID 22429566. ↑ Nikfar S, Rahimi R, Abdollahi M (October 2010). "A meta-analysis of the efficacy and tolerability of interferon-β in multiple sclerosis, overall and by drug and disease type". Clinical Therapeutics. 32 (11): 1871–88. doi:10.1016/j.clinthera.2010.10.006. PMID 21095482. ↑ Langreth, Robert (June 29, 2016). "Decoding Big Pharma's Secret Drug Pricing Practices". Bloomberg. Retrieved 15 July 2016. ↑ Gleason PP, Alexander GC, Starner CI, Ritter ST, Van Houten HK, Gunderson BW, Shah ND (September 2013). "Health plan utilization and costs of specialty drugs within 4 chronic conditions". Journal of Managed Care Pharmacy. 19 (7): 542–8. doi:10.18553/jmcp.2013.19.7.542. PMID 23964615.